Ha! 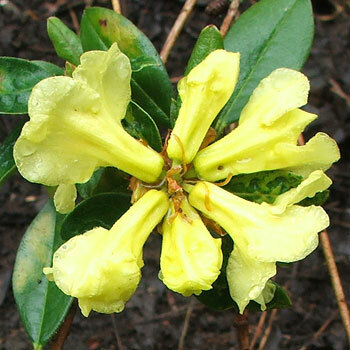 Here is my newest rhododendron, which I purchased and planted in spring 2004, and which still has its name label on! It's called Chrysomanicum - what an odd name! The label promises me a small compact shrub, with buttercup yellow flowers. I've planted it in the Pond-side garden, a little too close to the Yellow Wave flax, but never mind - the colour combination of these two with the wine red euphorbias is inspired. I hope that this rhododendron will be happy in this garden area - I decided that the border needed some spring shrub colour and substance. I wonder where the name Chrysomanicum comes from, though - let me know if you know! 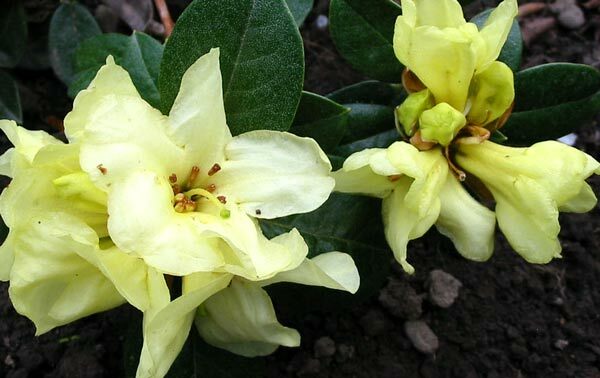 The name refers to the hybrid origin of this plant, a cross between Rhododendron (chryso)doron and Rh. bur(manicum), both considered a little on the tender side in Britain, though quite hardy on the west coast of Scotland. You can visit him at Arduaine Gardens in Scotland. Thanks so much, Maurice. Chrysomanicum has moved out of the Pond Paddock Gardens and into the Driveway Garden, where it has continued to spread. It's right on the first bend, and one of the very first rhododendrons in the garden to flower. What a beauty! My recent photographs show the colour to be much more of a citrus yellow, too.